Today was the day of shopping and meetings. After breakfast, we went to the market day in the city center. Phaly, her mother, her sister, her husband, Sengkeo and I, made some purchases, among others. I bought a pin for my mother from Mr. Phouvong's jewelry shop, one of the very busy branches. Back in the vicinity of the hotel, Ken and I visited Lao craft shops. We would like to exhibit their creations at our annual dinner in Winnipeg. I took the opportunity to buy cotton clothing which are super comfortable and cheap. We then met Vilat Rattanavong and his associate at the Cubic Art Gallery and Consultancy. He studied marketing in France and Japan. He is the director of the consulting company, whom in his free time, strives to raise awareness of their culture and traditions, people and young people in Laotian villages, by creating books, videos, etc. The company also seeks to encourage the consumption of Laotian products such as local coffee. Mr. Rattanavong would like to visit Canada in the near future. Then we went on the boardwalk near the Mekong to have a drink while passing by the super popular night market on Friday. The temperature is very pleasant tonight, 25 Celsius. We finished the evening at the Kap Khao Lao restaurant. In the company of Ken's family, we were able to eat once again delicious Laotian dishes: soups, salads, pork chops, fish lap, Beer Lao and water. Tomorrow I will return to Canada. Thanks to the Laotians for their warm welcome. It is too early to sum up our stay. However, it is certain that Laos is changing: more people, businesses and cars. As for SKL, we see progress, more students and villages with schools. However, there are many needs to be met. More villages are gathering together to get schools together. Villages lack buildings or want new buildings. Certainly, the work done by SKL is sincerely appreciated. Students are deeply grateful to donors everywhere (Canada, Singapore, USA, Australia, England, including Laos) for their help and unconditional support. Yesterday evening Sengkeo and I bought beautiful Lao scarves at the night market near the Mekong. These items will go on sale during our spring meal in Winnipeg next Spring. Today, after breakfast at the hotel, we devoted the whole morning to phone calls to find villages near Vientiane that would need a school. Upon evaluating the routes, our first choice was Ban Pakchanh. We left around 12:30 and arrived at the village almost two hours later. The road along the Mekong is in excellent condition and allows us to admire the landscapes of Laos and Thailand. 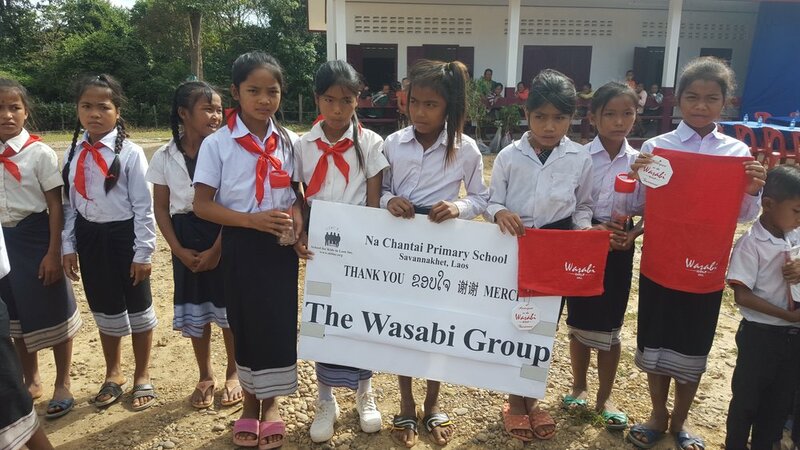 The small poor village of Pakchanh obtained a primary school thanks to the Japanese organization Jica in 2010. 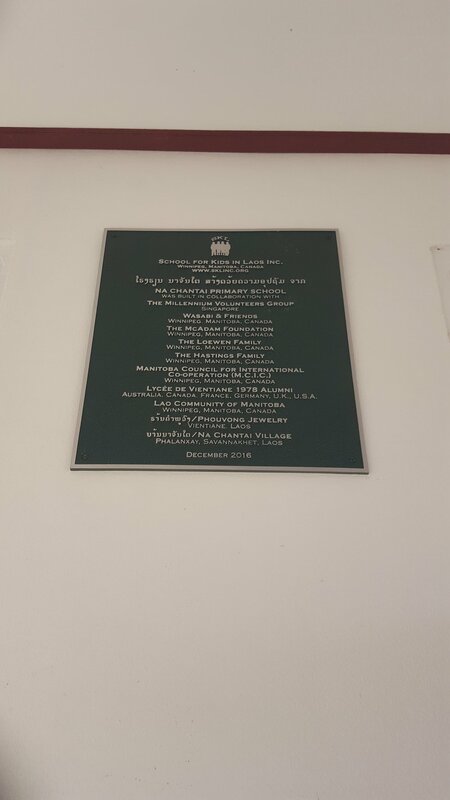 For years, the people of the village have been wanting a secondary school. Currently, children have to travel about 20 kilometers to reach the nearest school. The existence of a secondary school would also be beneficial for neighboring villages that would send their children there. At the moment, more than 125 students from Pakchanh would benefit. The potential site for a school was shown to us by the village chief. Work is underway to lower and level the ground. This possible location offers a magnificent view of the Mekong. A project like this would have a real impact on the community in the region. However, many steps must be taken. We exchanged our contact information in order to communicate in the near future. Back in Vientiane at 5 pm, we were invited by Mr. Phouvong, a famous businessman and jeweler in Laos. He celebrated his 33 career anniversary in the field. For the occasion, we visited the Pheuang Fa Hotel at 6.30 pm to attend a memorable banquet with hundreds of customers and employees of Phouvong Jeweler. We were able to enjoy a delicious meal, honored by the company of Phouvong and his wife at our table. To the sound of Laotian and English songs, we saw a few meters from us a spectacle, under the eyes of a dozen cameras and photographers, talented dancers and acrobats. Then, a young singer extremely popular seduced the public who rushed to him to listen to him while encircling him. An elegant fashion show followed suit featuring luxurious jewelry created by Mr. Phouvong's company, and featured by renowned models, including Miss Laos. Then a dynamic prize draw took place rewarding gold coins to customers and employee members. The evening, ended with traditional Laotian dances in which the audience of all ages participated with pleasure. We sincerely thank Phouvong. We went back to bed at the hotel shortly after midnight. Setha and Lili left early this morning in the direction of Houayxay, a province belonging to the famous Golden Triangle (Burma, Laos and Thailand). They will spend one night in one of the houses perched in the trees (Tree house) in the national park of the region of Bokeo. They will stay there a few days before going to Louang Prabang by bus to end their holidays. As for us, after having lunch, we went to visit the village of Ban Nalao, about 90 minutes from Vientiane. 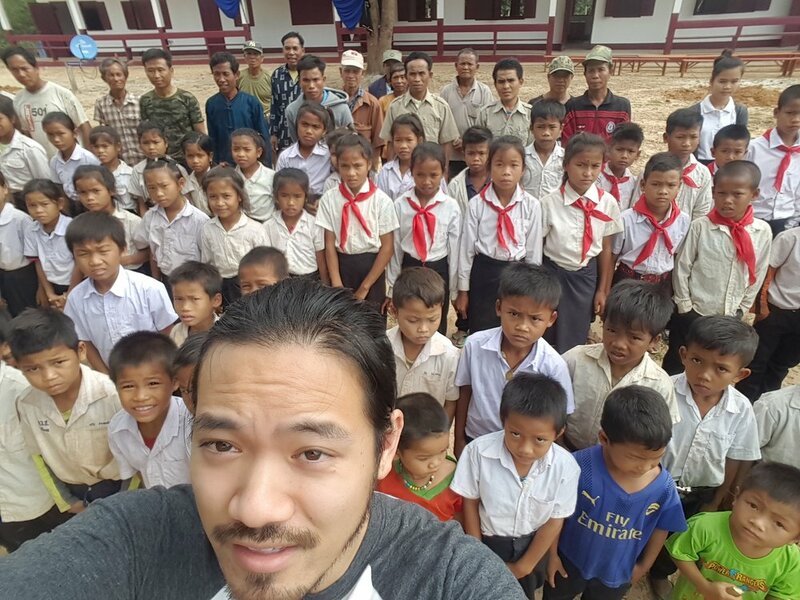 On the way, we received pictures from another school, Ban Namai. Even if this school, created by a Korean organization, seems worn out by time, it appears solid and far from being in a pitiful state. It does not require a visit. Arriving in Ban Nalao, we were surprised by the quantity of school buildings (12 to 14 for primary and secondary - serving nearly 3,000 young people). Several humanitarian organizations (from Korea, Japan, etc.) have collaborated. A single structure for primary school children is in a semi-permanent state. After talking with the principal, we found that this village is among the favored. Our assistance would not really be appropriate compared to the others we have seen. After lunch, we decided to go back to the village of Pakchanh to explain our rationale and our criteria to the village officials and teachers. About fifteen people listened attentively and clearly expressed their gratitude for our second visit. They are willing to contribute as much as they can. For now, SKL will consult its board of directors in January. For his part, Pakchanh will make an official request for a secondary school at the Ministry of Education. The land under consideration will be prepared by March, regardless of its future use. We will receive photos to document this potential candidate. This discussion was perceived to be very beneficial. We took the contact information of the persons concerned before returning to Vientiane. Tonight, as we walked down the streets of downtown, we were tempted by a small Korean restaurant with an authentic character (frequented by Koreans). On the menu: rice, sushi, beef dumplings, pork chops. The whole thing turned out to be very good and cheap. When we returned to the hotel, we allowed ourselves to buy and nibble some small sweet fries for sale at the corner of the streets. Another day ends. The end of our stay in Laos is fast approaching. It is very cool this morning, around 9 degrees Celsius. But the temperature will change in the day. We had a soup at 8am to warm us up for breakfast. Then at around 9:30, we went to the Education Office of Oudomxay Province. We talked with the deputy director and the head of construction. Our one-hour conversation proved rewarding. We are expecting up-to-date statistics on school attendance. Moreover, there seems to be a positive response to our priority criteria: maintenance of a school after its construction and assistance during a project staggered over several months. It looks promising so far. After having obtained our plane tickets at the airport in preparation for our trip back to Vientiane, we had time to visit a nearby school that had just benefited from the support of the humanitarian organization Human'Isa. We talked with teachers to learn more. Then back to the airport, we boarded our plane as scheduled at 12:30 noon. The flight lasted 50 minutes. FYI -- taxis are cheaper than the Jumbos, the Laotian Tuc-tucs. At the Douang Deuane Hotel, we rested briefly before strolling downtown to check out the tennis courts and the stadium used by runners and soccer players. At 6 pm, at the front of the hotel lobby’s Christmas Tree, we met Mr. Somphet Leenthasone, our travel agent, who found us tickets at good prices for our trips over the last few days, By this time, the temperature had reached a fine 30 degrees Celsius. Under a misty morning, we left at 8 am to explore five villages and their schools. The majority of the villages seem to have one, two or three school buildings. Often a school in one village will accommodate several neighboring villages. Many humanitarian and government agencies are visible in the region, for instance UNICEF who supports the funding of school latrines, possibly because of the railroad from nearby China. After identifying some villages with potential for SKL, we went to the district education office to gather more information and check their interest in collaborating, more specifically regarding the maintenance of the land and building after construction which is one of our criteria on the list. We got more details about two villages, one named Chantai, and the other named Ban Na. The district has no plans for maintenance if there is a construction, therefore has no interest in this approach. We visited them in the presence of the students; however, Chantai does not need new classrooms right now as its priority would be a library, which does not fit with us. Ban Na on the other hand, serves primary level (327 students) and secondary level (673 students). They already have buildings in good condition which were built in 2013 and 2015, but also have temporary buildings in poor condition. SKL's assistance might be relevant in this case, as we did in Viengkham. There was a lack of classes needed to accommodate all students. The people of the village would be willing to collaborate in a percentage of 50%. This can be an interesting candidate with a fairly large field to build on. On our return to the city center of Oudomxay, our colleague/driver guide, Somkhit, informed us that he had built schools. He is a qualified experienced entrepreneur. After choosing our very nice and comfortable hotel, the Xaysana, we were curious to see his work. He took us to the top of a mountain in the late afternoon, braving very damaged roads for 90 minutes, to discover Lavang, a picturesque village perched in the clouds, inhabited by villagers with a particular dialect. The landscapes are spectacular. Mr. Somkhit built six to seven buildings in 2006, including classrooms, dormitories and dwellings for more than 325 high school students. It was impressive. This village also deserves to have an additional construction to serve the young people residing in the 6 to 12 neighboring villages. It would be an amazing story to tell and film about this village. Upon our return in the evening, we went to supper at a restaurant that is well-known to foreign visitors, the Kanya. On the menu: rice, chicken soup, chicken laap, vegetables, cucumber and lettuce, and Beer Lao. Everything was very good. After dinner, we headed to the hotel for the night and chatted about our plans and adventures for tomorrow. We had a quick breakfast this morning before we left. We loaded all of our luggage into the pickup truck. We left Savannakhet in the direction of Pakse at 8:15 am. After three hours of driving, we arrived just in time to catch our flights. Jackie, Victoria and Colin registered their luggage for their return flight to Canada with several layovers, including one at Siam Reap. As for us, Ken and I got our ticket back to Vientiane. Our one-hour flight departed thirty minutes later. In Vientiane, we had the pleasure to meet Sengkeo, Setha and Lili at the Douang Deuane Hotel. In the late afternoon, we visited Ken's family, his brother Khampoun, his wife, their daughter Phaly and her 1-month newborn Nam. We then attended a ceremony commemorating Ken's late uncle. We were able to revisit family members, chatting while eating a traditional meal with a variety of meats, vegetables, soup and desserts. By 9 pm, we returned to the hotel for a good night’s sleep. This morning, entrepreneur and jeweler Mr. Phouvong, one of our major local donors, invited us for breakfast. He came by car and picked us up at the hotel at 8pm. Sengkeo, Ken and I felt very comfortable in his new and luxurious car. At his office, Mr. Phouvong told us about his great recreational park project, a place of relaxation, located thirty minutes from Vientiane. He expects to complete it in 2017. After an unexpected invitation, we met Mr. Viraphon, Deputy Minister in the Department of Energy and Mines in Laos. We had an interesting conversation on several topical subjects. We got back at the hotel by 12:30 noon and had a small lunch with Phaly, her husband and daughter Nam. Later in the afternoon we attended a family friend’s traditional wedding ceremony with Phaly, her sister and her parents. While waiting for the village chief, we had a good Laotian meal, with laap, fried fish, duck, salads, tangerine and longan. Upon the arrival of the village chief, we participated in a baci ceremony. The couple was radiant with happiness in their beautiful traditional Lao clothes. We returned to the hotel around 9pm. We had breakfast at around 8:00 am at the hotel. Setha and Lili left today for Vang Vieng, a charming town in the northern region of Laos. Ken and I flew to a new destination: Oudomxay northwest of Luang Prabang. After two hours of driving, we visited some schools in villages of the region. International organizations in Korea and Vietnam have also built schools there in the recent years. We observe that the number of students in clustered villages seems to be increasing. Some villages seem to fit SKL’s criteria; but it is still too early to decide. After yet another good soup, we headed to the Souvanly Hotel to rest. We will continue to visit other villages tomorrow with Mr. Som Khit. The day started with an early breakfast at the cafe next door to the hotel. Then we loaded into the van for a two-hour plus drive to Na Chantai. The children were ready and waiting to greet us. We took lots of photos before the formal program started. Friends of SKL received a scarf each by the locals. Many thanks were shared and friendships renewed with people travelling from as far away as England, Canada, USA and Australia. The baci ceremony was inspiring as always and we come away with many blessings. Lunch was served and many conversations shared before it was time to head back to Savannakhet. After a quick rest, we decided to head out for dinner before saying goodbye to Setha and Lili. They will leave for Vientiane on a VIP night bus with sleeping amenities. We found a delightful place on the Mekong river. Unfortunately no spectacular sunset but excellent food and company. And for some of us it was time to say farewell to Laos and start the long journey back to Winnipeg. It has been an incredible experience. Life is changing here in Laos but the friendliness and the beauty remain a constant. Today we slept in a little more and set off for ban Na Chantai at 9.30 am. After the bumpy roads of the past few days today was a breeze. We found the school to be perfect. A job well done by Toui and his team! We took photos of the children at school. They were shy at first but warmed to us. It was a great day planning the festivities for tomorrow with the deputy of district education officer and the village elders. Later on, back to Savannakhet, we were invited by Thaviseuth’s family for dinner. And what a dinner! Bamboo soup, laap, Mekong fried fish, pork roast, and more. Feasting with food and memories shared a fitting eve of the school opening. Tomorrow after an early start, we will have a day full of celebration. Another successful school thanks to SKL. Today we left Paksé heading towards Savannakhet. But first we had a delicious buffet breakfast with more choices than most restaurants. Toui met us around 8am and we headed off in search of another potential school site. 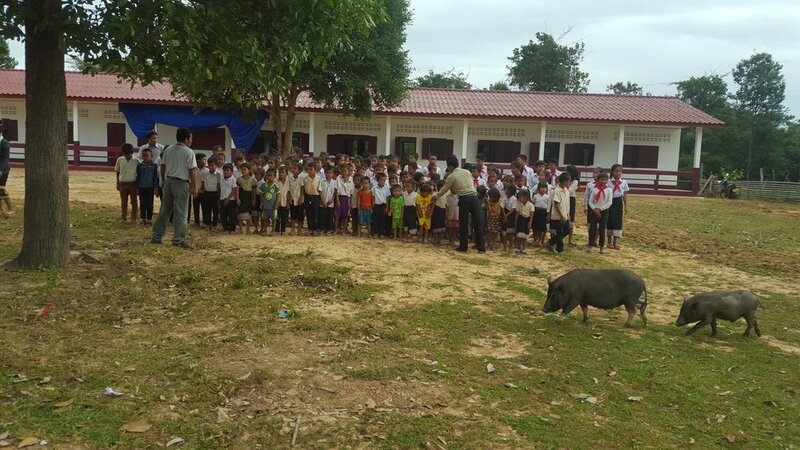 A Laotian businessman, Mr. Kia, had been in touch with Ken to see if we could help to finish a school. We met up with him around noon, not far from Savannakhet. An hour drive over very bumpy roads and about 10 bridges most of which didn't look like they would hold our weight we made it to our destination. A lunch of baguettes with all the fixings was laid out for us. Ken's school friend Thaviseuth also joined us. We listened to the request made by Mr. Kia, and by the chief of the district as well as several other local representants. Then we went to see the school. It needs another classroom and more furniture. Toui had left us to go to Na Chantai. We piled into Thaviseuth’s car to find more schools in the district. More bumpy roads later and many schools all of which were fairly new and not needing SKL help. With that it was time to head to the city. With Setha and Lili sitting in the front, Ken, Francois and Jackie in the back with the video camera, a dozen soccer balls and a couple of bags it was a tight squeeze over very bumpy roads! We arrived at the Avalon hotel around 6:30 pm. We ate around 7:30 pm at the Aura restaurant. Then we prepared some bags with school and sport items for each grade. They will be given at the inauguration of the Na Chantai school. Monday morning saw us all up bright and early – we had breakfast at 7am. We were on our way to view a potential school site but first we had to stop to pick up some pork sandwiches from a roadside vendor for lunch. We travelled through the beautiful countryside until we reached Xekong province. We discovered that we needed to get a flat bed ferry to reach our scouting area! 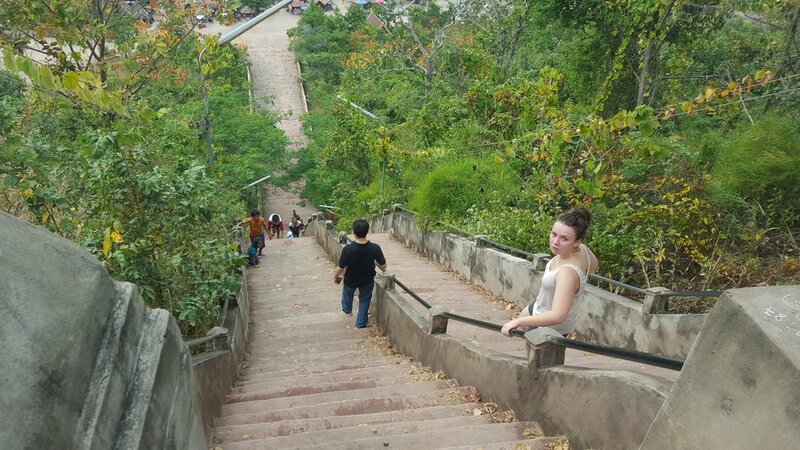 A steep slope down to the ferry was expertly handled by Toui. If only we had known that this was going to be the easiest part of the journey! After getting off the ferry we encountered some pretty interesting roads to say the least - full of deep ruts and in two separate places we had to cross a ford. Halfway up a rather steep hill and over 4 hours into our journey the van started to overheat so we stopped to enjoy the incredible view and ask a travelling salesman where the village was located. 30 km away at the top of that hill over there he told us! Well it had taken us 90 mins to do 38km we decided we wouldn't be able to make it before it got dark and so we turned back to Paksé. On our way back we stopped off to visit the Tad Gneuang waterfall and taste some tea and coffee at the Bea Plantation. We had a great supper at the Daolin restaurant very popular with foreigners. Thinking about today’s adventure, I won't be complaining about Manitoba roads, well at least until I'm back in Winnipeg! All the team of SKL met up in Paksé, south of Vientiane in Laos. At first we went for a Lao lunch in a Vietnamese restaurant. It was delicious. Then we decided to climb a few too many stairs to have a nice view over the area. Afterwards we took the time to visit a big temple on Mount Sadao, where a huge golden statue of Buddha is meditating. The panorama over the city is magnificent. We finished the day with a quiet supper on a floating restaurant by the river. It was fantastic but spicy. Welcome to the SKL 2016 trip to Laos. 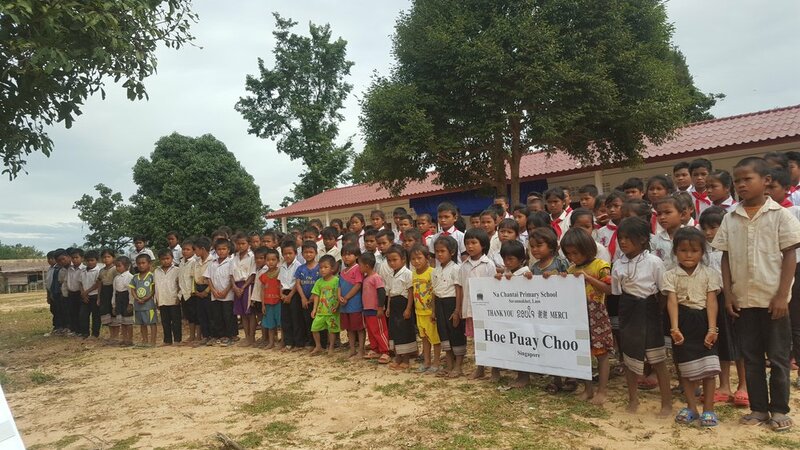 We will be embarking on our journey to Laos as a team to inaugurate the newest school in Na Chantai! Come see the final result of your support and donations! We hope you enjoy flying with us for the next few weeks. We will be arriving in the first/second week of December.